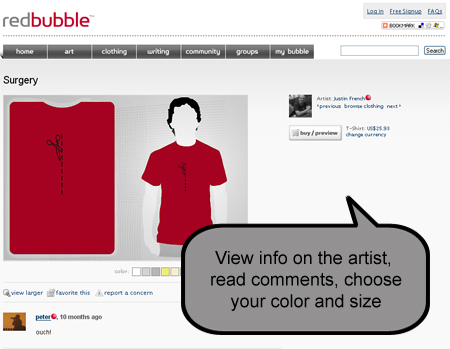 Red Bubble is an “art gallery and creative community” with t-shirts that are “designed by your neighbors”. You can submit or buy art on wall art, posters, t-shirts and greeting cards. Members can join groups and communicate with those who have similar interests. There really is some amazing stuff on the site and lots of features to talk about but today I really only talking about a recent t-shirt I ordered. 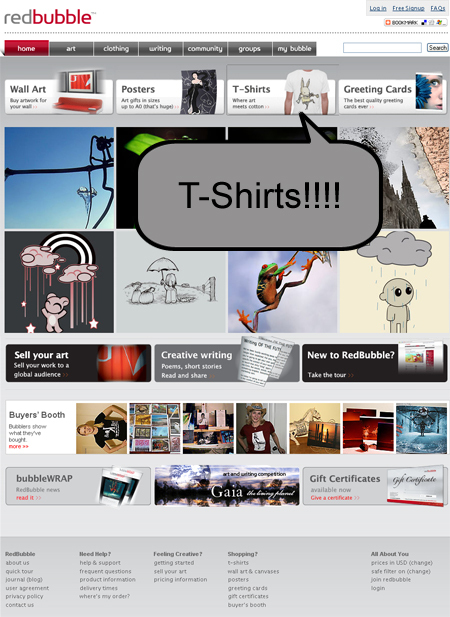 You can browse over 700 different t-shirts from artists all around the world. And guess what arrived in my mailbox? 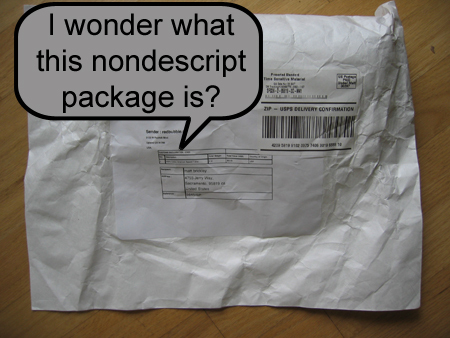 Inside the envelope was a t-shirt rolled up and held together with a sticker label. Here is a view from the side. 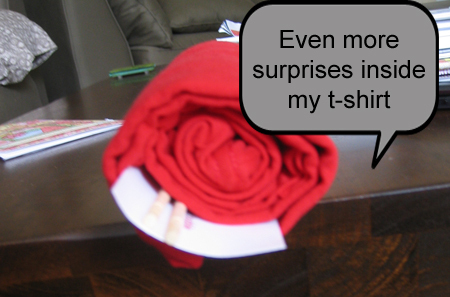 As you can see there are more goodies rolled up inside the t-shirt. Inside was sales propaganda and a set of chopsticks. Some might think its “cute” but personally I find it wasteful. So here is a closeup of the sticker label that held the t-shirt in a sushi roll that included the designer and design name. 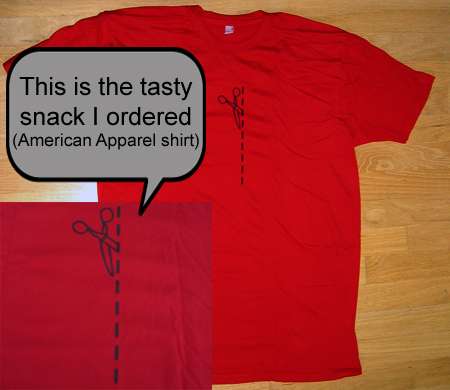 And finally, below is the t-shirt “Surgery” that I ordered. Sorry about the differences in color my photographs were not very good this time. The shirt is American Apparel and quite nice. It is really hard to tell Red Bubble print quality when buying just a simple black text t-shirt but it looked good for what it was. My favorite part of the Red Bubble order/experience is how the recognize who the artist was and the name of the t-shirt. It would be great if they also added a link to the artists gallery to further give them the credit they deserve. Go check out Red Bubble for yourself and let us know what you think. I went briefly to the website. Looks like a new print on demand fulfillment site. There are more and more of them each day! The sushi roll marketing ploy does not impress me. What do you mean that Red Bubble abuses your designs? 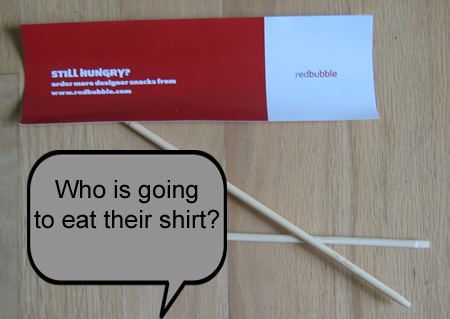 hmm – I’ve been on Red Bubble for several months and run 2 groups. I haven’t met any teenagers yet and I certainly haven’t seen anyone abusing anyone’s designs. As for the sushi roll – it’s kind of cute – trying to set themselves apart and be very “artsy”, but… I’d rather that money went back into the site – especially for ways to promote their contributors. Anyone have feedback on how the more complex images last after a few washes? Some shirts look so great, but after 10 washes or so, look kinda sad. thanks if anyone has anything to say. Do you have pictures of how the shirts look now? Did you wash your shirt inside out? I am not sure about the inks but they use the Kornit printers. I love the packaging designs for those tees, they rock! I’ve found that the tees haven’t faded yet . I had them a few months and wear them frequently. I wash them inside out. I only wish there base price was a bit lower. 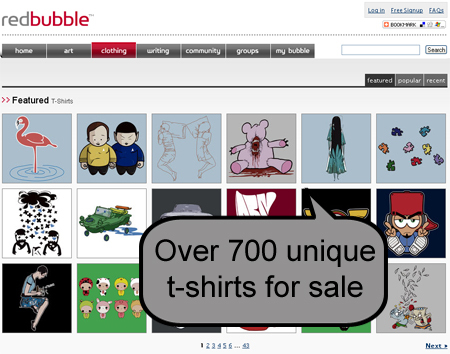 Redbubble has hardly changed at all in 3 years, just got a little bit bigger. Red Bubble are the worse company that I have dealt with on the internet. I ordered a T-shirt with a picture of my car on it, which a friend of mine had drawn. The first order never turned up, after over a month of waiting I contacted Red bubble who told me to contact my local post office. I went and waited down the post office for 30 minutes one Saturday morning, only to be told that I had wasted my time and that the Royal mail would never hold onto my parcel if I had not had one of their calling cards. I then contacted Red bubble again who suggested that my local postman may have been at fault? My postman manages to deliver £100’s of car parts to my house every day with no problems, but cannot handle a £15 T-shirt? After nearly 2 months I contacted Redbubble again and told them that I was very unhappy. they finally agreed to resend the T-shirt. After nearly another month the T-shirt did finally turn up and the printing was so crooked that the T-shirt was only fit for the bin. I contacted Redbubble again who asked for pictures. I sent pictures to them and then THEY ASKED FOR MORE PICTURES? At this point I was so annoyed I went mad. I demanded my money back and told them to pick the piece of crap T-shirt up. After well over 3 months I finally got my refund and I still have the crappy, poor quality T-shirt that they had sent me. The customer service that I got from Redbubble was beyond bad. I would never dream of buying from them again. Take my advice, if you are an artist there are other websites that offer the same services but actually give a toss about their customers. Redbubble are a con, they use poor quality T-shirts and cant even print a design straight. Im sure that 100’s of people are happy with their products, but if you are an unlucky one like me then good luck in getting your money back.